The way archaeology was meant to be! 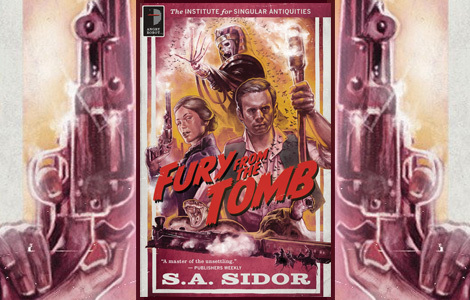 When I saw “Fury from the Tomb,” by S.A. Sidor, at the bookstore, I knew it was a match made in camp heaven. Look at that cover art. Or this quote from main character Romulus Hardy: “Egypt is how I got to Mexico.” What the heck could that even mean? I had to know. Fun fact: As I said, I discovered this at an actual bookstore. No online bookstore ever suggested it. I feel like their algorithms just don’t get me. It’s like high school all over again. Let’s get down to business: The year is 1886 and a young, wanna-be archaeologist, Rom Hardy, desperately desires to find a way to live his dream of uncovering history and treasure in Egypt. Too bad he’s stuck in Chicago. But then, out of nowhere, a mysterious benefactor offers him his opportunity. Hardy arrives in Egypt with far more ambition than experience, so he eagerly follows the instructions of his patron. When he breaks through and makes an unlikely discovery, he illegally spirits the artifacts to America. And then all hell breaks loose: vampires, undead bandits, train robberies, Egyptian cults in Mexico, and, of course, one seriously powerful mummy. I wrote “camp heaven,” but Fury from the Tomb is not campy. It’s serious without being too serious. It’s adventure-horror, if such a thing exists. The story is entirely from the main character’s point of view, which grounds the proceedings in their own reality. Everything works. Secondary characters are well-drawn, mysteries are doled out a little at a time, not everything, or everyone, is exactly as it first appears, a handful of big set-pieces dominate the story in an almost cinematic way, it’s incredibly fun. In fact, it would make a pretty good movie, if done right. If there can be a complaint, it’s that the opening moves a little too quickly. You’re barely introduced to the main character before he’s suddenly off to Egypt, a solid year passes by, then he makes a find, then he’s back in America, and you still don’t know a lot about him. The inciting incident really isn’t until much later in the book, making the whole trip to Egypt and incredibly long prologue. You can tell the inciting incident is later because the main character is kind of aimless until that moment. At least, that’s how I saw it. But after that, it’s a non-stop, classic horror thrill ride.